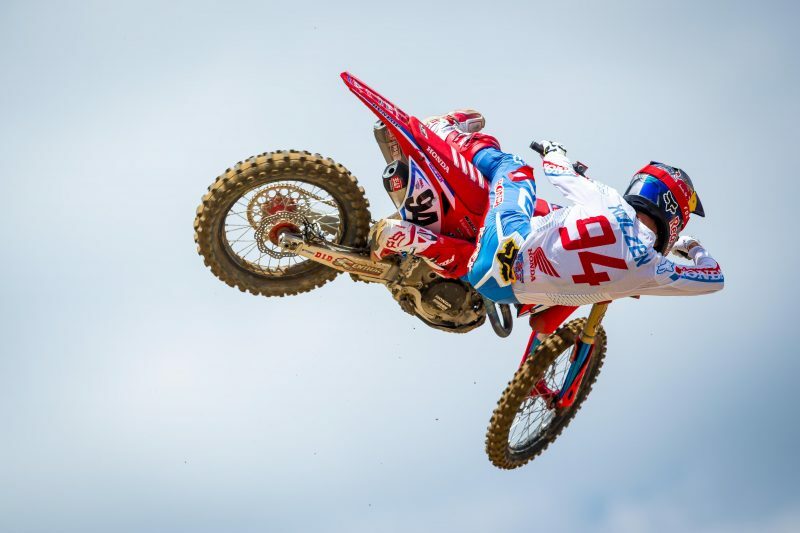 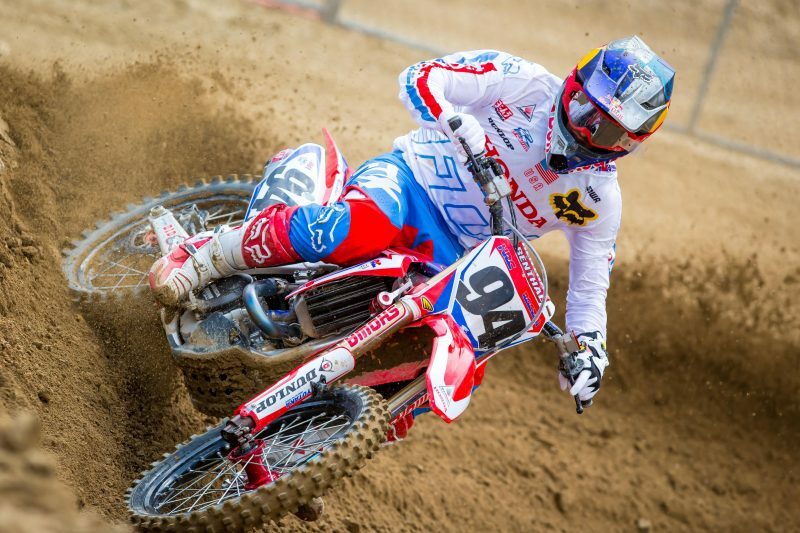 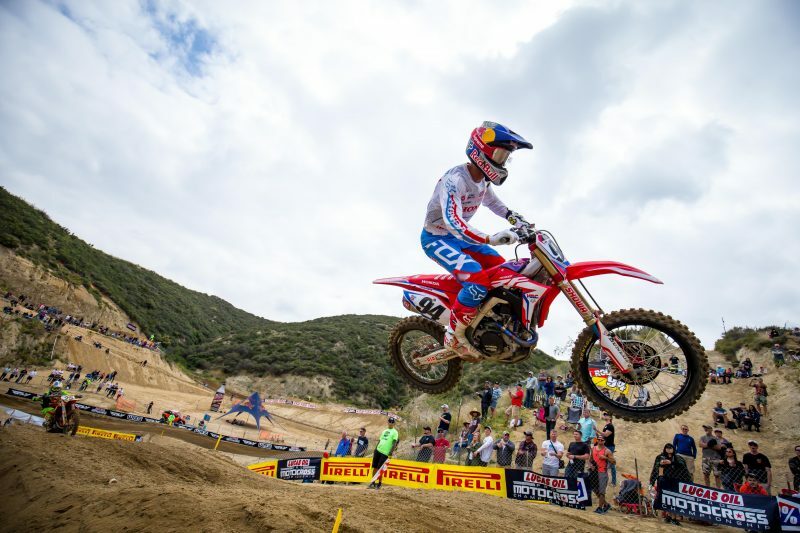 Round two of the AMA Pro Motocross Championship took place at San Bernardino, California’s Glen Helen Raceway, where Team Honda HRC’s Ken Roczen scored an impressive fifth overall in only his second race back from injury, via 3-8 moto scores. 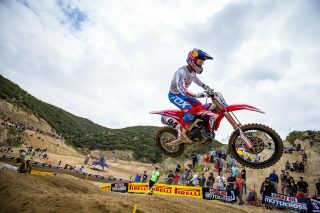 Unfortunately, teammate Christian Craig was injured in the first 450MX moto, forcing him to withdraw from the race. 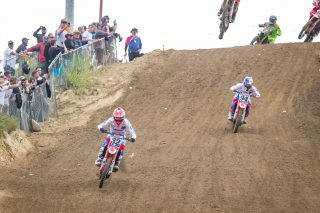 In moto one, Craig scored the holeshot aboard his CRF450R, with Roczen in tow. 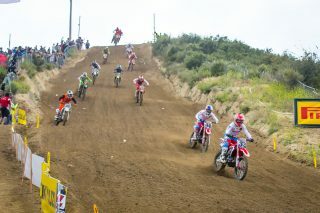 On the opening lap, Craig went down hard and was slow to remount. He was forced to withdraw from the race and sit out the remainder of the day with an injured left knee. 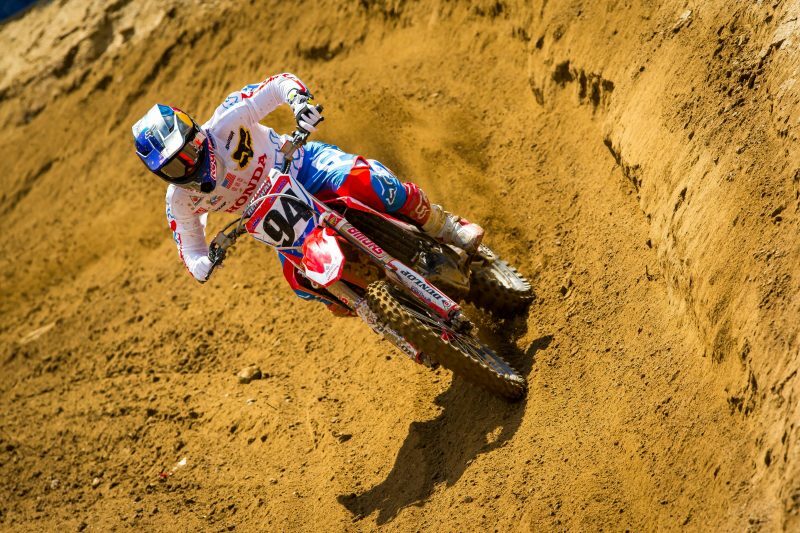 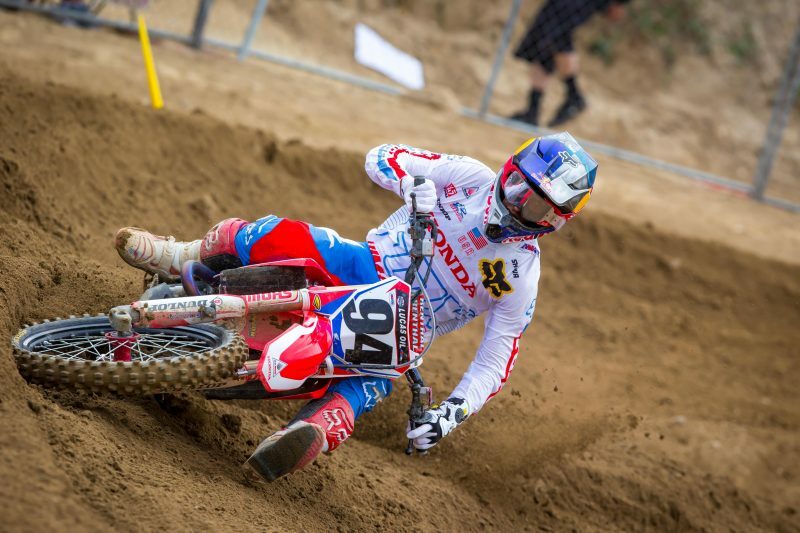 With Craig down, Roczen moved into the lead, where he remained for over half of the 30-minute-plus-two-lap race. 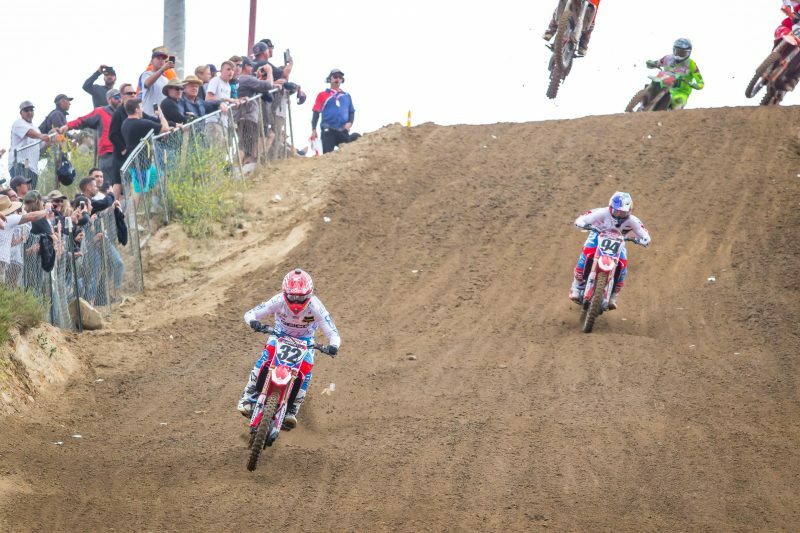 A small mistake allowed Eli Tomac to close the gap, but Roczen held tough, fighting hard to maintain the front spot. 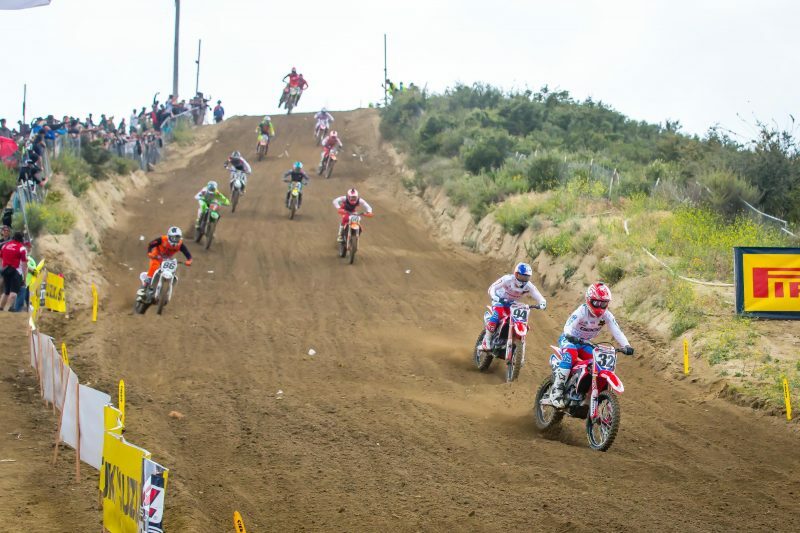 With 11 minutes remaining, the German was unable to fend off Tomac’s advances and relinquished the lead. 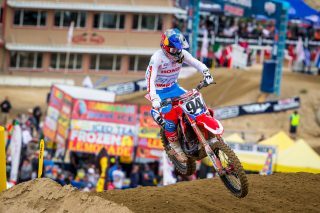 During the final laps, Roczen came under fire once again, losing one more position before taking the checkered flag in third. 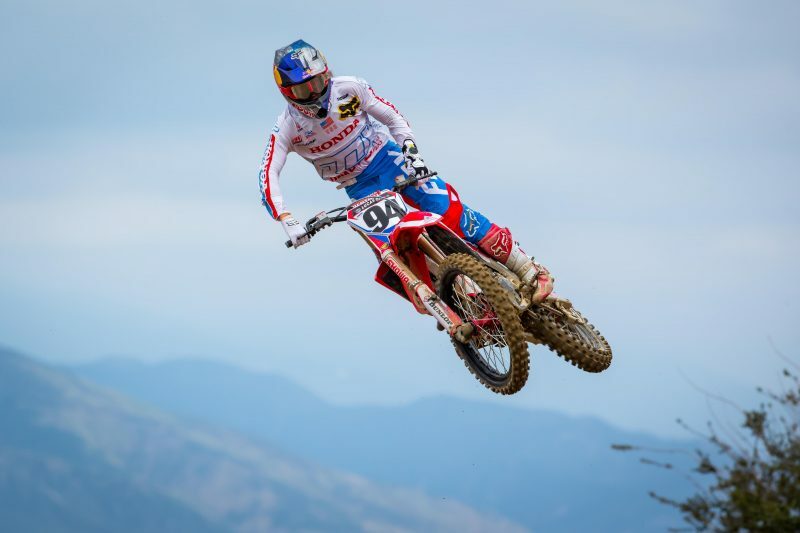 When the gate dropped in moto two, Roczen came around the Talladega first turn in fourth and quickly moved into second, but when he heard a noise he decided to be cautious and roll to the mechanics’ area, where a rock was found wedged in his countershaft-sprocket cover. 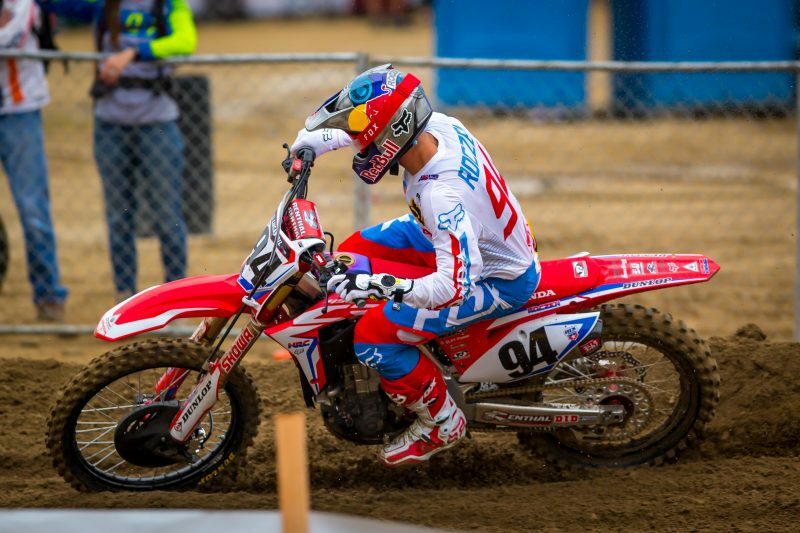 Once it was removed, Roczen returned to action in nearly dead-last position. 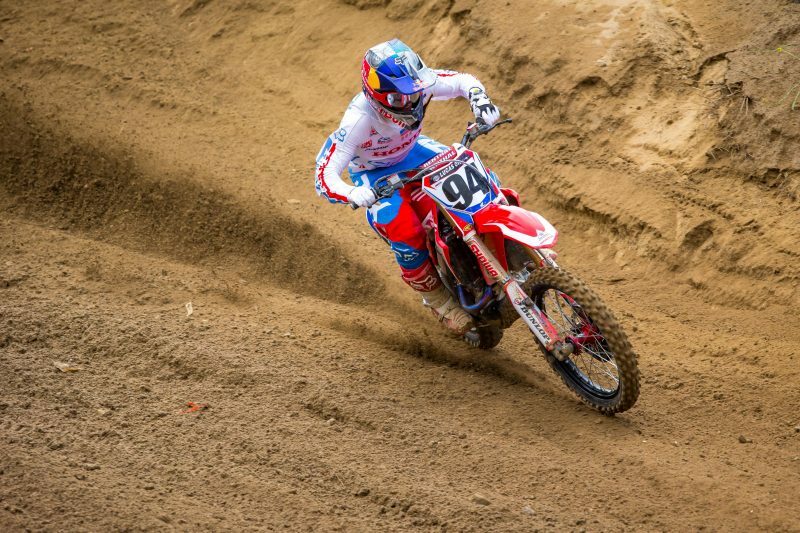 He spent the remainder of the 14-lap race surging through the pack, putting together an impressive come-from-behind performance to finish the moto in eighth. 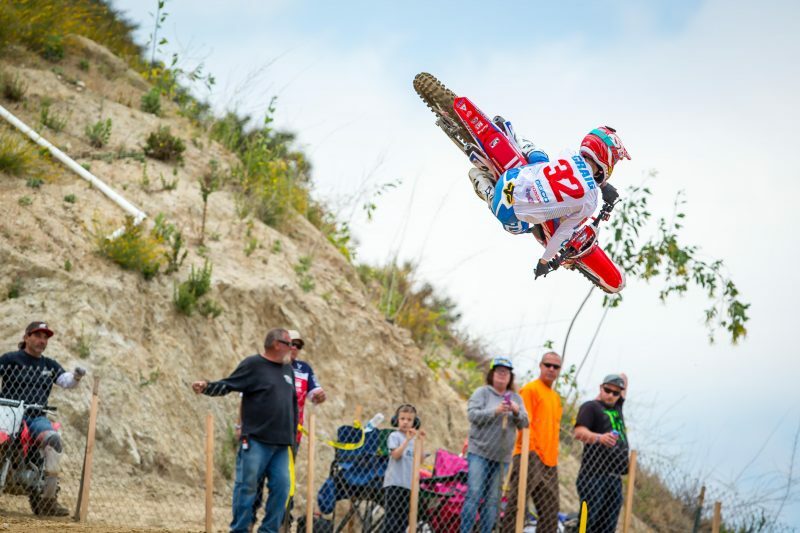 On Friday morning, Christian Craig arrived at Glen Helen Raceway early for a press appearance with KTLA Channel 5 News, the Los Angeles area’s top station. 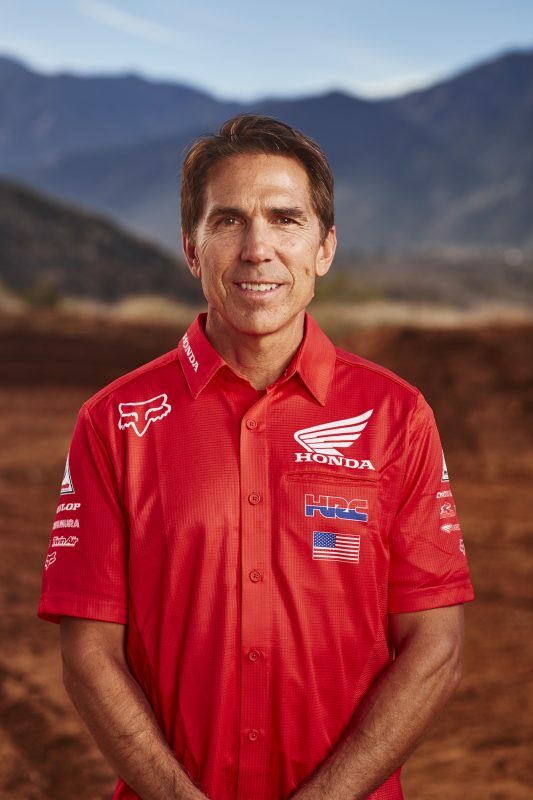 Craig was featured in three segments with reporter Erin Myers, including a learn-to-ride piece during which he showed her the general controls on a CRF125F before assisting her while she rode. 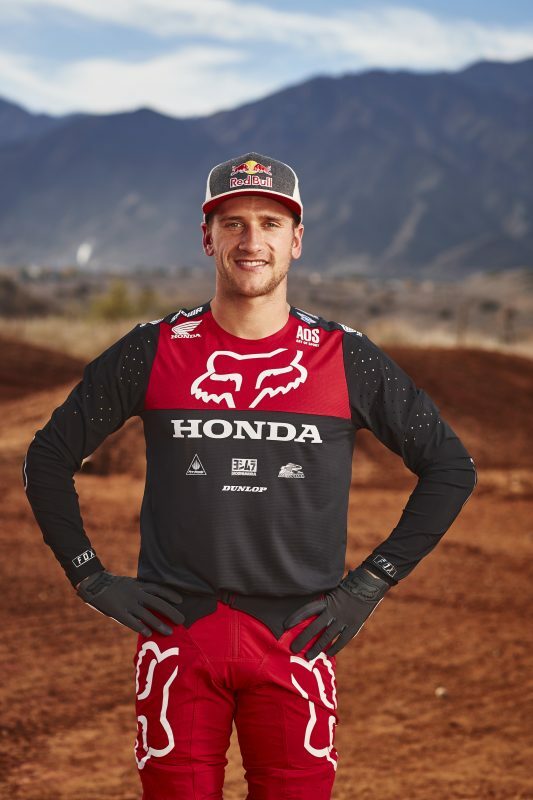 For the second consecutive week, the Honda Red Riders participated in press day, allowing Craig and Ken Roczen to ride a pair of 20-minute practice sessions. 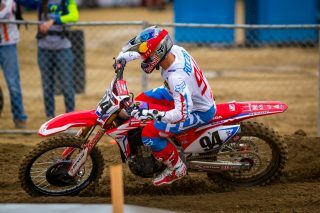 It was beneficial for both riders, as they used it for additional testing time prior to Saturday’s race. 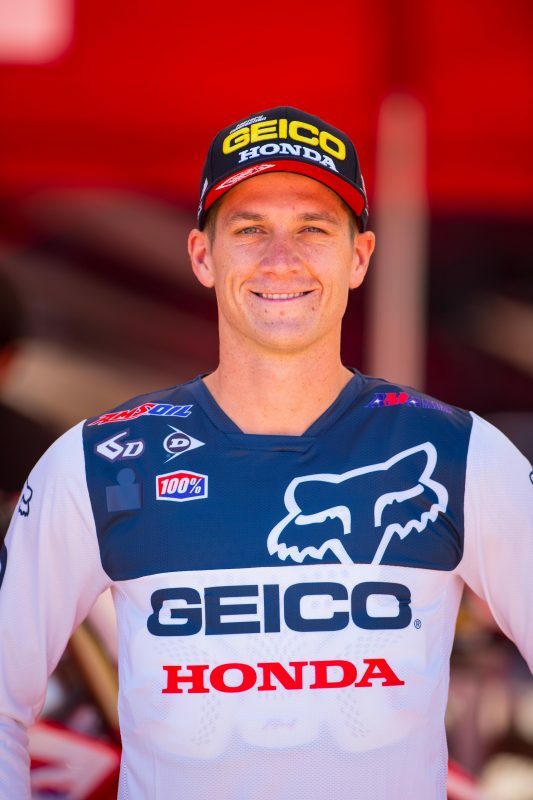 During the Saturday morning qualifying practice period, Craig was sixth-fastest with a 2’40.45” time in the second session, while Roczen was eighth with a 2’42.22” lap. 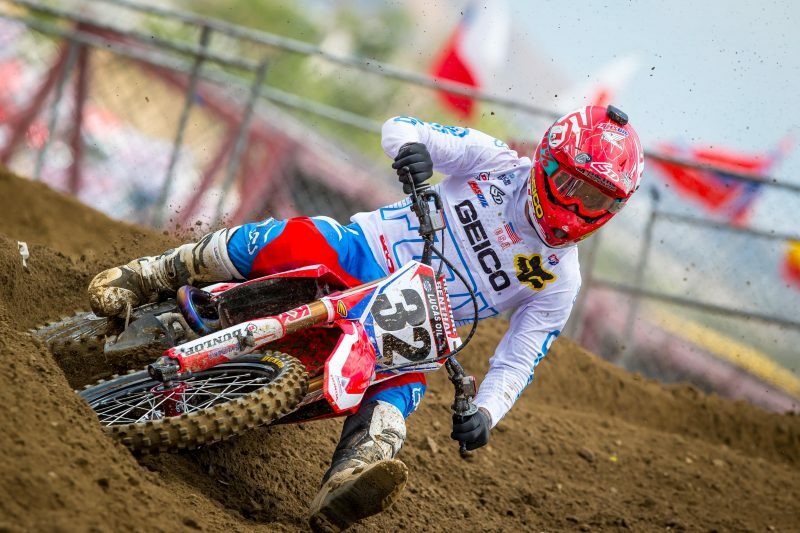 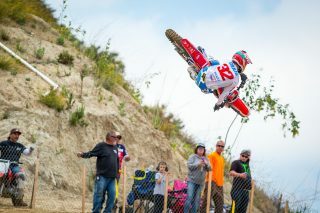 In the 250MX class, GEICO Honda’s Jeremy Martin put together another solid performance aboard his CRF250R, riding to his second podium finish in two races, with 5-2 results. 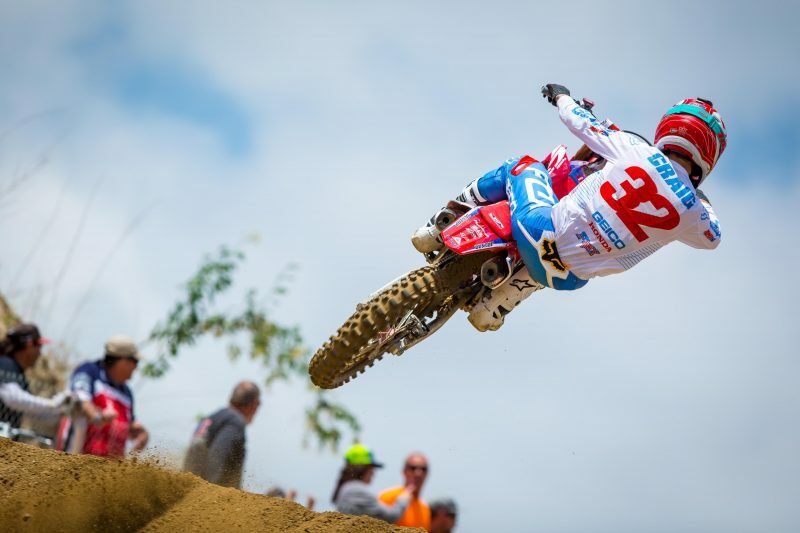 Teammate RJ Hampshire wrapped up the day in seventh overall with 8-9 marks, while Chase Sexton overcame mistakes to finish ninth with 10-8 scores. Craig visited the doctor the day after his injury, where it was confirmed that he had torn his ACL and will require surgery. 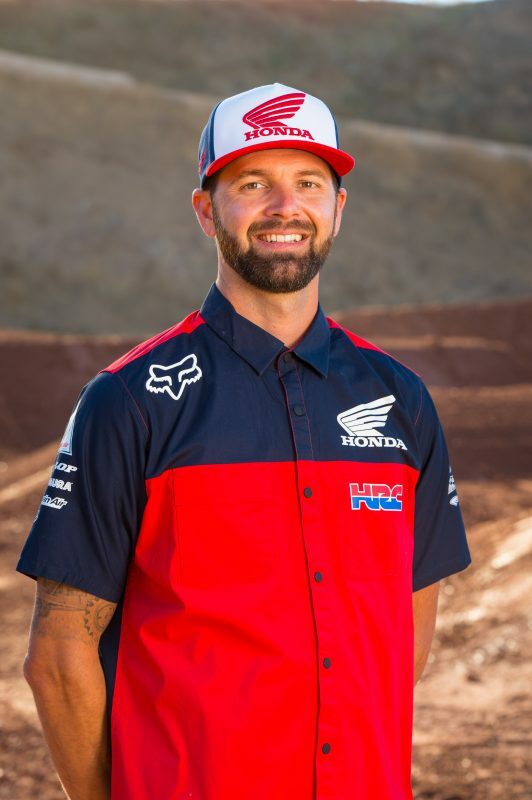 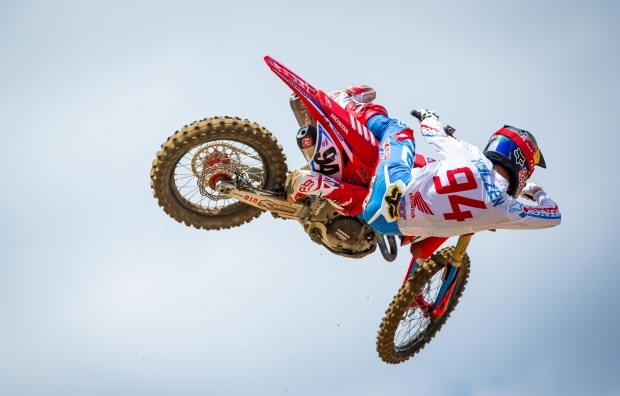 Team Honda HRC will return to action on June 2 for round 3 of AMA Pro Motocross in Lakewood, Colorado, also known as the Thunder Valley National. 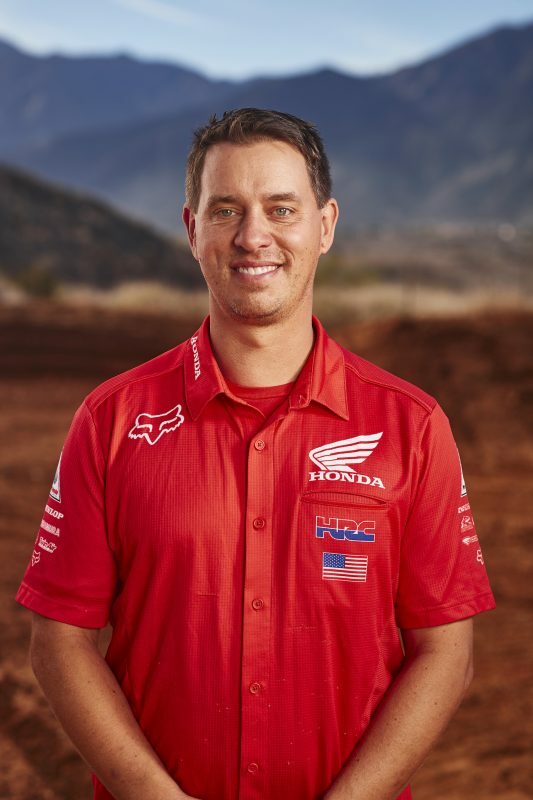 On Friday, Team Honda HRC and the GEICO Honda squad will visit the newest local dealership, Peak Honda World, for an autograph session.